On the surface not tilling the soil is counterintuitive to many traditional gardeners – until the science behind it is understood. Tilling (roto-tilling, deep spading or plowing) is used to break up and loosen soil, turn up weeds and incorporate soil amendments. However, tilling destroys the fungal networks, soil organisms, hummus and insect life that lives in and naturally improves soil health. Pick up a handful of soil from the forest floor, which is not tilled, and it will be dark loose and have a pleasant earthy aroma. Continually tilling soil destroys beneficial microorganisms (including mycorrhizae, arthropods and earthworms), disturbs natural porosity resulting in compaction, contributes to soil erosion and water evaporation. In no till or “lasagna” gardening the soil is left undisturbed under layers of protective mulch. This improves soil quality by keeping fungal hyphae and microorganisms in the soil intact; reduces soil compaction; protects from soil erosion (topsoil washed or blown away); reduces evaporation of water; and, therefore, can improve plant health. No till also saves your back from fighting the roto-tiller or deep spading. Plantings are done in shallow holes or ditches with minimum disturbance to the soil biome. The no till method can be used to create a new garden or convert existing gardens and can apply to both food crops and ornamental plantings. For an existing garden or ornamentals adding annual layers of mulch, such as disease-free leaves, or compost will break down and feed the soil, this, in turn, provides a healthy growing medium for the plants. To create a new garden, or convert an existing bed: You can make a lasagna garden at any time but fall is the optimal time to start as most gardeners have more of the materials needed via fall clean-up and the bed(s) can sit over the winter and decompose. Pick a spot in a sunny area and layout the design. To prevent soil compaction, the width of the bed(s) should allow you to reach across the bed without stepping into the planting area. For multiple beds create pathways between them and cover with wood chips, gravel or stepping stone to alleviate weeds. If your chosen area is bare or contains young, seed free weeds, you can start layering. If your area is inhabited by root/rhizome spreading grass such as Bermuda or Johnson grass your best action is to dig it out first – don’t till with a roto-tiller as this only spreads the rhizomes which will re-grow. Now you can start layering with several layers of cardboard and/or thick newspaper (not shredded) being sure to overlap the edges. Over this add a layer of leaves (brown material) as this will help break down the cardboard/newspaper quickly. (Browns include leaves, pine needles, peat, shredded newspaper.) Then add a layer of greens or compost (vegetable scraps, disease and seed free garden clippings or weeds, grass clippings, not Bermuda, coffee grounds or purchased compost). The brown layer should be twice the depth of green layer but doesn’t need to be exact. Over this you can add a layer of chicken fertilizer or composted manure. If creating the bed in the spring or summer, it is advisable to add a soil-like layer of peat or topsoil (allows for earlier planting). You can create multiple layers of this composition to your desired height. Finish off the bed with the topsoil. Sprinkle each layer with water as you build the bed. Top the bed with a thick layer of mulch; straw, dead plant material or wood chips. If using wood chips wait until next year to plant as these can be acidic and harm young plants. Your layered garden will shrink in height as it decomposes. Just add more brown, green and compost layers annually. You should see an abundance of earthworms develop in your beds, which enhances soil health. Remove any weeds that develop on a regular basis and incorporate into the green layer. You can also plant cover crops in the winter (such as clovers, beans, peas or alfalfa) then chop or mow off before seeds develop and allow to decompose on the bed(s). These cover crops help break up the soil with deep roots. It is best not to leave the soil bare or unprotected over the winter. If not planting a cover crop apply a thick layer of mulch. 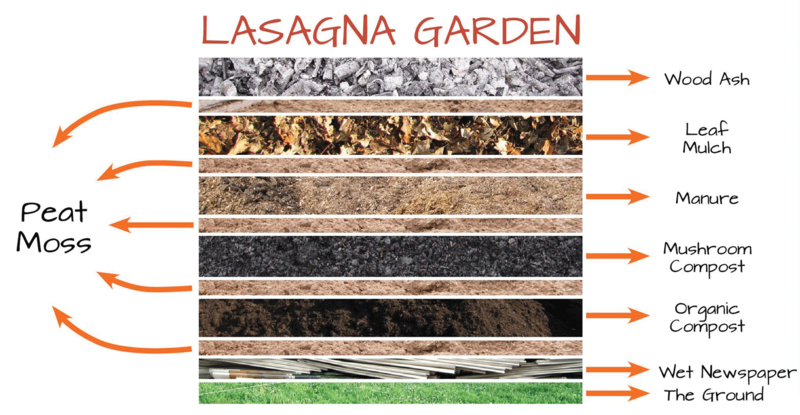 By creating the “lasagna” garden in the fall you can let it sit and “cook” until spring. Then it is ready to plant. Using a garden fork loosens the soil without inverting the natural soil layers. A hand trowel can be used to make small holes for transplants. Just don’t till your lasagna beds. It takes some time to develop these healthy beds, but your plants will love it and you should see food and flower production increase. The UCCE Master Gardeners will be available to answer your gardening questions at the Tulare Garden Festival on April 6 from 10 a.m. to 2 p.m. at Tulare Public Library, 475 N. M St. in Tulare; each Friday at the Visalia Senior Garden, 310 N. Locust St. from 11 a.m. to noon; and each Saturday at the Visalia Farmer’s Market in the Sears parking lot from 8 to 11 a.m.